I’ve been given the OK from the powers that be to announce some exciting news! I am of the 12 talented artists chosen for the 2009 (yes, can you believe they are already planning for 2009? 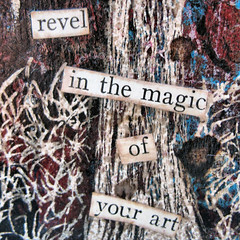 )Collage for Your Creative Spirit wall calendar! While the 2009 version is not complete yet, the amazing 2008 one is.. go check it out – It has the work of Claudine Hellmuth, The Altered Diva, and 10 other amazing artists! They will be using a spread from the ‘A Work in Progress’ Skinny Book I created for Issue 13 of Cloth, Paper, Scissors magazine. You can see photos of my book here, but I have yet to finish taking & uploading all the pictures of it — There are 20 some pieces of incredibly-difficult-to-photograph original art in it. A special thanks to Lunnea Weatherstone for asking me to contribute to this. I am both flattered and honored.. and a bit more then excited to be a part of this. How am I supposed to wait so long to see the results? Ikes! Patience is NOT my greatest virtue! Thanks for sharing in my excitement y’all! Congratulations, Chrysti! You must be over the moon. I’m enjoying your blog and your work. Your work is amazing. Congratulations on the calendar! Congrats!!! You must be so excited!!! I received word that one of my photos is in the Los Ranchos de Albuquerque Annual Village Calendar and I am doing the happy dance too!!! Great going Chrysti! 2009 will be the best yet! Congratulations Chrysti..we’re all very proud of you! You consistently dazzle me Chrysti; I am so very proud to know you. Congratulations on another great creative score! Congratulations Chrysti. Amazing news for an amazing artist. Yippee!!! Congratulations! Of course, in my mind, it’s a foregone conclusion that you would be chosen for much public recognition. You are truly a talented artist and a kind person. Now the world must be told! Wonderful! How exciting and such an inspiration to hear of another artist’s successes…thank you SO much for sharing! Can’t wait to hear about the other top secret kudos!! Woohoo! Congrats! Good Going! Yeah, 2009 seems like a long time to wait! Keep us posted. How Cool is that! Good for you, your work is beautiful. Do keep us all in the loop!